Word was floating around that the Union Pacific’s #4141 was parked over at the U.P. yard in Addis, Louisiana today. 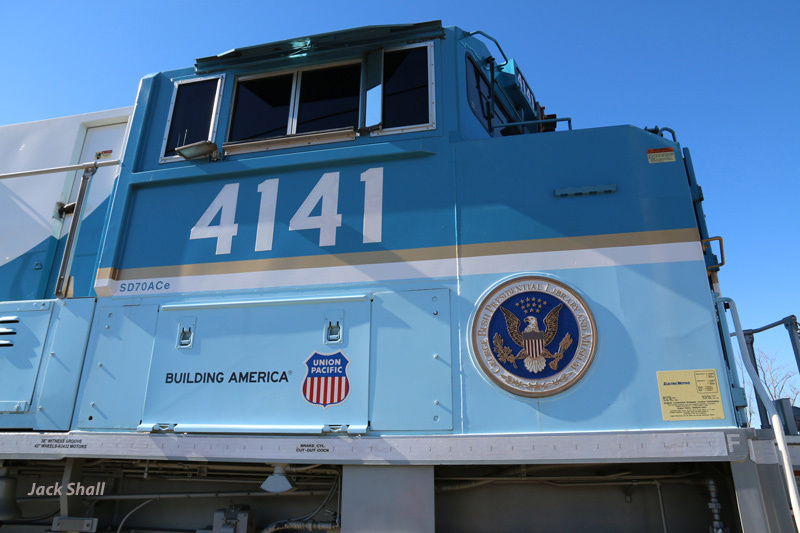 This is the locomotive that pulled the funeral train of the late President George H. W. Bush to Texas during his recent funeral. Naturally I felt compelled to investigate, so my friend Ron Findley and I headed over across the Mississippi River late this morning. Arriving in Addis, we found the prize, along with locomotive #1943, the “Spirit of the Union Pacific”. This locomotive is an Electro-Motive SD70ACe, and it was manufactured in Canada in June, 2005. Below is a close-up view of the cab. The Bush Presidential Library plaque is seen on the side of the hood. The weather in this area has been terrible lately, with thunderstorms and such almost daily. But today we were rewarded with sun and beautiful blue skies . . . perfect weather for a bit of railfanning. 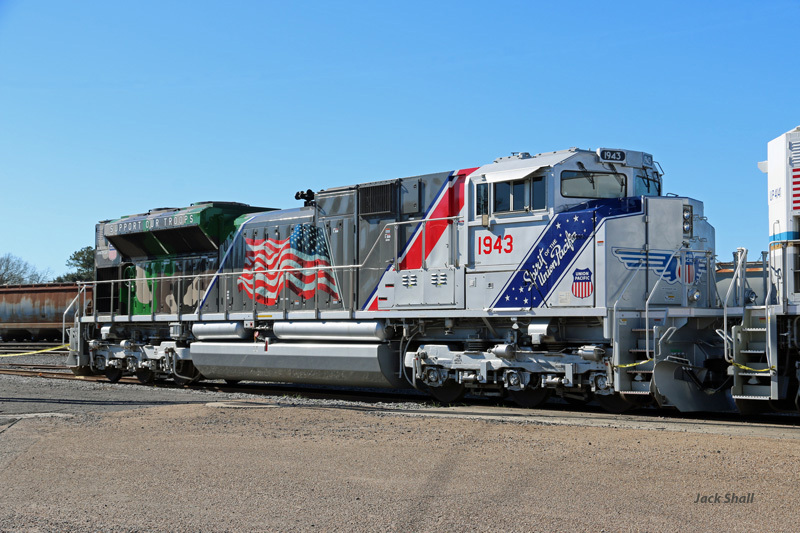 The 4141 was paired with another interesting locomotive, an SD70AH #1943, and it’s named “Spirit of the Union Pacific”. 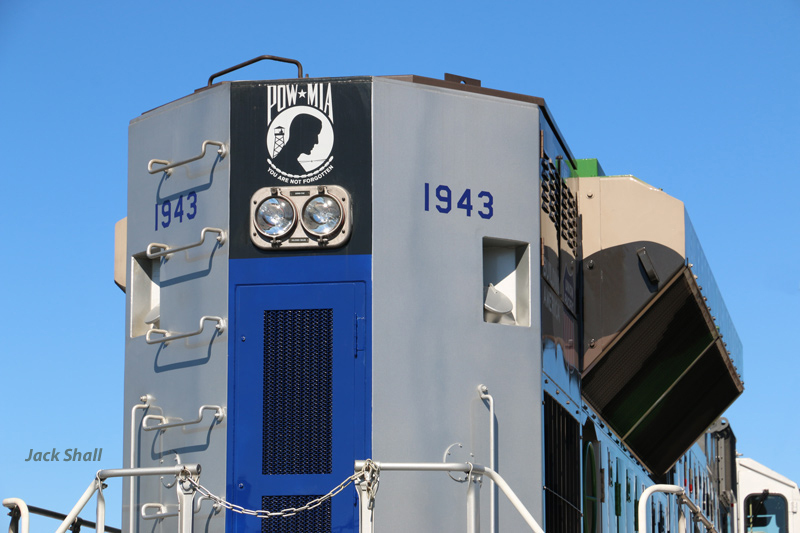 This locomotive pays tribute to our military. And below is a close-up view of the rear of the 1943. Note the POW-MIA remembrance. This pair of locomotives is indeed an impressive sight, and I’m thrilled that we were fortunate to see them. Even though the U.P. has published that the locomotives are touring their system for their employees to view, they were very hospitable to the crowd of “civilians” that encroached upon their property today. This entry was posted in Railfanning by Jack Shall. Bookmark the permalink. Matt, you fellows are just going to have to adjust! Y’all should try Hammond out. The CN seems to be picking up the traffic a bit. It’s not uncommon to see seven or more trains in daylight hours now. Indeed, I spend more time in Hammond (about 35 miles distant) railfanning than I do in Baton Rouge. It was cool seeing the enjoyment all were having being up close to these locomotives. Everyone appeared to have a respect for what they were viewing. The engineer that we spoke to (who was to move the locomotives over to Livonia this morning) seemed to be honored to have been assigned that duty.